Want access to Scholastica law review submissions season stats including: law review open timeframes, peak submissions timeframes, publication decision timeframes and more? 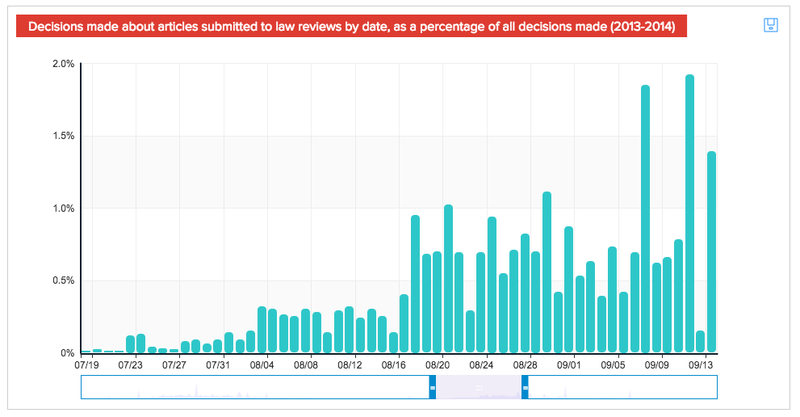 Check out our interactive law review submissions stats webpage! Each law review submissions season we encounter similar questions from authors. When is the best time to submit an article? When do journals begin reading articles? When do authors tend to make expedite requests? The list goes on. As an author, submission season presents a lot of uncertainties, which can be unnerving after spending months perfecting an article. Knowing this, we decided to take action to help authors answer those nagging submissions quandaries. Inspired by Prawfsblawg’s post “Some Results from the Law Review Submission Practices Survey” we’ve gathered insights from Scholastica submissions data and compiled a series of interactive graphs, which you can access by clicking here. The graphs are anonymized and aggregated, of course. We’ve included our own analysis for each of these graphs, as well as information on the many qualitative dimensions that impact law review submissions. What you’ll find is, there is no true “best time” to submit to law reviews. Submissions data only tells part of the story, because qualitative submissions factors that vary from journal to journal and year to year will always have an impact. However, there are certainly trends to be observed! We hope you find these law review submissions insights helpful! If you have any questions about this data or suggestions for other data insights you’d like us to provide, don’t hesitate to email us at support@scholasticahq.com.